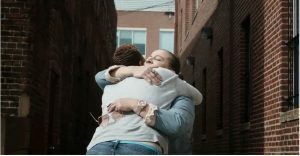 Verlette embraces her case worker at Calvary Women’s Services. “I’m excited about my new life.” After years of struggling with alcohol and substance abuse, Verlette decided it was time to make a change. She had always relied on her family as a safety net, but when her father passed away she knew the moment had come to tackle her difficult personal issues head on. That’s when she came to Calvary Women’s Services. At Calvary, Verlette found a safe home and a sisterhood of support as she began her new life. She worked closely with her case manager, developing a road map toward independence and establishing techniques to maintain sobriety. Eventually she got a job, and her own apartment. She is now the lead teacher at a child development center. Perhaps the most important accomplishment for her personally, Verlette has also made amends with her family. Watch the video to hear Verlette’s Story in her own words, and to learn about the promise she made to her parents years ago, a promise she is proud to keep.